A Pharmacist’s Perspective on Why Drugs Don’t Work. 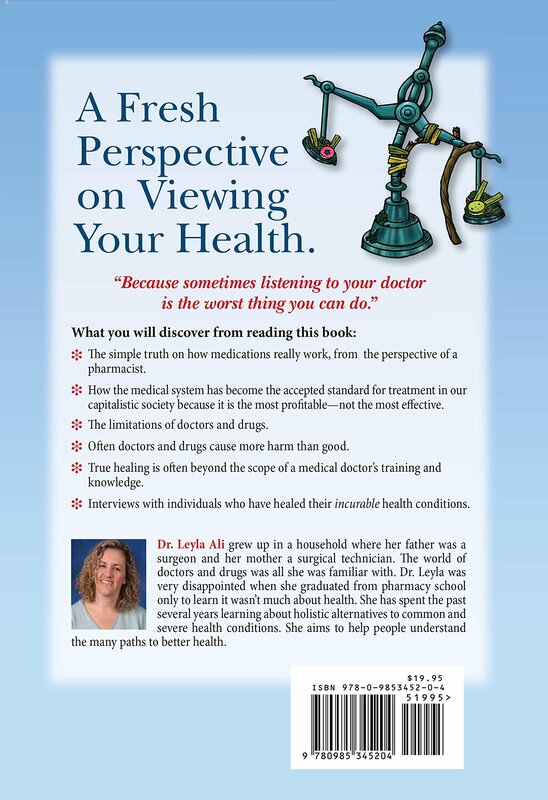 I recently read the book Off Balance – The American Way of Health – A Pharmacist’s Perspective on Why Drugs Don’t Work by Dr. Leyla Ali, PharmD and it was just the book I have looked for. In my gut I knew all these pills that our doctors and pharmaceutical companies had pushed on us with a vengeance could not be all that they were cracked up to be. I mean, look at all the side effects! The side effects are worse than the condition you are taking them for. Dr. Ali is a Pharmacist educated in the field of medicine and holistic alternatives and is able to put into words the damage that these medications have done to our bodies and back it up with written documentation that shows these drugs are not the answer. Could the agenda of the pharmaceutical companies just be to make a profit (a huge one at that) from us rather that heal us? They make so many billions of dollars off of a medication that by the time we experience the adverse side effects the companies have plenty of money to pay off the lawsuits against them and still have more than plenty of profit left over. Dr. Ali explains to us in her book how for thousands of years humans have relied on plants and alternative medicine such as acupuncture in China and Ayurvedic medicine in India. They know that health is a combination of mind, body, and spirit. Western medicine has completely lost sight of these concepts and just want to go for the quick and easy cover-up of our symptoms, no matter how dangerous. Since adolescence I have seen different doctors trying to get help for my physical and mental illnesses. I’ve struggled with depression and anxiety nearly my entire life. None of these doctors were ever able to help me. They just prescribed me pill after pill, adding new symptoms on top of the ones I was suffering with. This year I have completely changed my life by changing my diet by eating only organic whole foods. No more chemicals or over processed junk like I was used to eating on a daily basis. I have also eliminated foods that are inflammatory to our bodies such as sugar, gluten, soy, dairy, legumes, and nightshades. Eating this way has not only helped me feel better physically, but it has helped with my mental state more than any medication has. One of the things I enjoyed the most about this book was how in each chapter she included different interviews she had done with a variety of people; from holistic practitioners to people who have changed their lives by living naturopathic, homeopathic, and holistic lifestyles. I’m so glad I was given the chance to review this book for my blog otherwise I might never have known about it. I learned so much and it even inspired to me to keep up with my new healthy lifestyle. If you want to be pro-active in your health and not just rely on what the doctors and pharmaceutical companies have told you, then I highly recommend reading this book. I would love to hear your opinions on alternative medicine verses Western medicine. Feel free to leave me a comment. I look forward to hearing your point of view. To purchase your own copy of the book on Amazon click here. There are certain times when “alternative medicine” can safely be used, but there are times when traditional medicine absolutely must be used. Thank you for sharing this post, I found it very interesting.